It's an event so popular, it's sold out up to a year in advance. It's an experience so powerful, participants willingly pay the $30,000 ticket price -- and return again and again. It's a place where dreams are made, expectations are exceeded, and multimillionaires are born. It's the Maui Mastermind, the most exclusive wealth retreat in the world, and its secrets have been kept behind closed doors -- until now. It's your turn to become a Maui Millionaire. For the first time, Maui Mastermind founders David Finkel and Diane Kennedy share the key steps to creating and maintaining great wealth that they have taught to their elite clients. The Maui Millionaires reveals just how easy it is to become exceptionally rich by creating consistent income streams, networking with other like-minded individuals, and giving back to the community. The authors teach you the Maui Wealth Leverage Strategies -- five life-altering techniques that you can start applying today to build tremendous wealth. You'll see how, by changing the way you look at money, you can practically guarantee your financial freedom. You'll learn about the awesome power of a Mastermind Group, one of the most powerful tools for building a healthy and successful life. 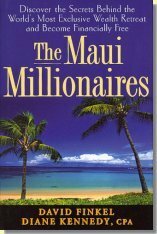 You'll also hear the real-life success stories of the authors and their Maui Millionaire clients, which will inspire you to live the life you've always dreamed about. Take charge of your financial destiny today with The Maui Millionaires -- and join the exclusive ranks of the richest, happiest, most fulfilled people in the world.